Joshua Beidler has been writing about health and nutrition since 2008. In addition to being the author of two books, he has written for "Vision Magazine" and other publications. Beidler holds a certificate in clinical nutrition, as well as a Bachelor of Arts in English from the University of San Diego. Taaka vodka is produced and marketed by the Sazerac Company of New Orleans. As with other spirits, the calorie content of vodka varies, depending on the proof. The number of calories in a serving of vodka depends on the alcohol content. Alcohol content is measured by proof, which is defined as twice the percentage of alcohol by volume. Taaka vodka is available in 80, 90 and 100 proof versions. 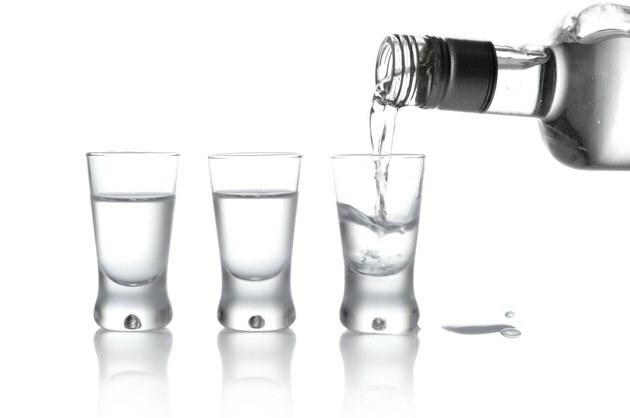 The standard serving size for vodka is a jigger, which is equivalent to 1.5 fl. oz., or 42 g. One jigger of 80, 90 or 100 proof vodka contains 97, 111 or 124 calories, respectively. The ingredients in vodka are water, alcohol and sometimes flavorings. Vodka does not contain fat, protein or carbohydrates. It does contain small amounts of potassium, phosphorus and sodium, but it is not a significant source of any nutrient. How Many Calories in a Vodka Martini?